Raised trim lines the perimeter for a modern look. Product Description One of a Kind. Eye-catching and functional in every way, the Britto nightstand is a stunning addition to your bedroom. The ash tone brilliantly emphasizes the natural wood grains like a work of art. Sleek contemporary lines paired with custom platinum rippled hardware further enhance the contemporary vibe. This piece is finished with a tempered glass top for protection from abrasions to the wood. 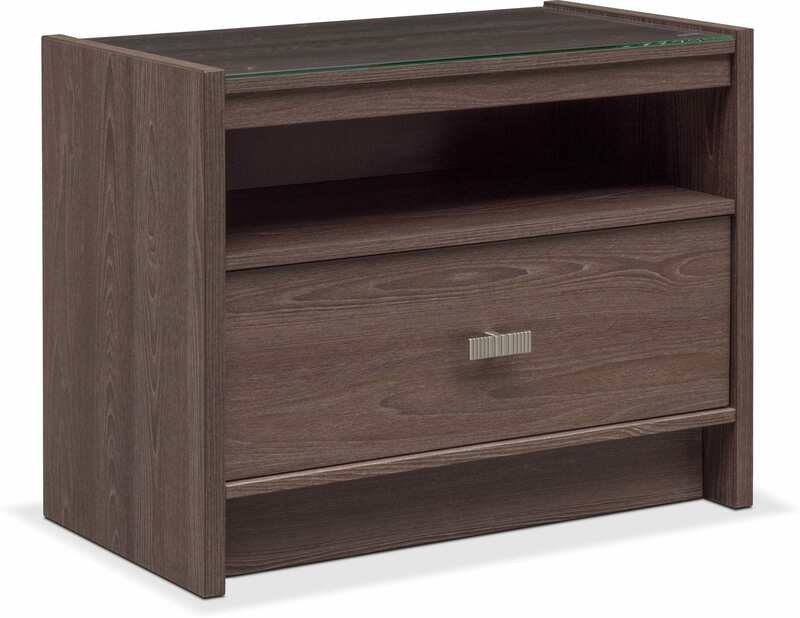 A deep drawer and open storage offer bountiful room for your bedside essentials. Customer assembly required. Unique Features: Custom platinum rippled drawer pull is distinct and easy to grasp. An ashy graystone finish emphasizes the textures of the wood. A tempered glass top protects the wood from scratches and abrasions. Boasting both closed and open storage. Resilient medium-density fiberboard panels ensure longevity and stability. Drawers: Featuring doweled joints, wood cleats and metal fasteners for smooth drawer motion.